It's scarcely a state secret that I love novelty jewelry (see, well, the vast majority of my outfits here over the years :D), and it's probably even less of a surprise to anyone who knows me and my blog that I live for Halloween (seriously). When those two passions combine, it's accessorizing bliss in my books! And with the explosion in recent years of independent and smaller sized jewelry lines that cater to those with old school leanings, it's been tremendously exciting to see a slew of sensational Halloween related bijoux hit the (often virtual) shelves as of late. Add to the mix genuine vintage pieces that were either designed specifically with Halloween in mind or which can fit the bill in a heartbeat (e.g., bat, spider and autumn leaf themed items) and the modern gal who adores looking to the past for her wardrobe choices is practically spoiled for choice - especially since a lot of these types of items can be had for relatively reasonable rates that don't have to break the bank for most folks. So many fantastic options now exist in the vintage inspired/vintage reproduction/cute handmade Halloween jewelry field that it was genuinely hard to cap this list of festively fun finds at "just" 31 different items (one for every day that October houses). 1. From the workshop of wildly talented designer Kirbee Lawler comes this enchantingly beautiful laser cut acrylic brooch depicting a redheaded witch sporting a glittery crescent moon on her pointy black hat. Swoon!!! $27.33 from Kirbee Art (it's also available in a fab green skinned version as well). 2. Luxulite designer Katy really goes all out when it comes to her marvelous Halloween creations - much to the unending delight of fall jewelry fans everywhere. In addition to a slew of fabulous brooches, she also offers up festive necklaces and earrings, such as the stylish jack-o-lantern themed demi-parure (you can also purchase just one of the two pieces individually, if so desired) shown here. $34.64 from Luxulite. 3. No doubt like many others the world over, my jaw all but hit the ground when I saw Erstwilder's exciting new Halloween jewelry line this year, which includes this deeply cool "Full of Woe?" Wednesday Addams inspired brooch (as well as eight other October 31st perfect offerings). $34.95 AUD from Erstwilder. 4. Equally fantastic for Halloween themed outfits and those worn at other times throughout the fall (if not all year 'round, too), this charmingly pretty mid-century vintage orangey-red thermoset plastic autumn leaf necklace is a dazzling piece that can be dressed up or down to your heart's content. $25.00 from Chronically Vintage on Etsy. 5. Whether you prefer the primarily black or the mainly orange version - or adore both equally - these cute laser cute acrylic jack-o-lantern pumpkin dangle earrings with their heart shaped eyes are a definite must for any Halloween jewelry lover. $18.00 from I'm Your Present (who stock a wide range of Halloween themed jewelry and fashions - I'm also quite partial to their spider web earrings and trick or treat bunting necklace). 6. Rocking an illustration style that instantly calls to mind artwork from turn of the last century Halloween postcards and decorations, this sophisticatedly sweet black enamel and copper hued metal bat pin is the perfect piece to sport on your lapel (or hat, handbag, hairscarf, etc) now and leave on for a dose of spooky fun long after the last jack-o-lantern has been snuffed out for the season. $10.00 from Cat Coven. 7. What could be more seasonally appropriate - or versatile - than a beautifully sweet stretch bracelet made of smiling jack-o-lantern polymer clay beads and elastic cord? In fact, I'd be tempted to buy multiples and stack them or wear one on each wrist for even more pumpkiny fun! $13.32 from By The Shed. 8. From popular French vintage inspired jewelry line Glitter Paradise comes this enticingly lovely black and white Ouija planchette brooch that is sure to appeal one's Halloween adoring spirit (see what I did there? :D). $16.20 from Glitter Paradise. 9. Sporting a colour palette that instantly evokes thoughts of fall and Halloween pumpkins, this fun mid-century orange and white polka dot plastic bangle bracelet would look awesome as part of many different costumes and festive ensembles alike. $18.00 from Chronically Vintage on Etsy. 10. Marry your love of all things vintage tiki related with your passion for October 31st care of this splendidly adorable handmade jack-o-lantern pumpkin brooch, which is crafted right here in my own country of Canada. $14.79 from Back To Betty. 11. What has these charming old school style black kitties all agasp? Could it be how amazing you'll look when you rock this fashionable vintage inspired hand painted black resin charm bracelet? (That's also available in a coordinating necklace.) $22.00 - $26.00 (depending on bracelet length) from Charcoal Designs. 12. From the shop of fellow vintage fan and fashion blogger, Laurie Duncan, comes this wonderfully adorable little handmade felt bat face lapel pin (that would look so charming pinned to a hat or snood as well!). $10.00 from Happy As A Lark. 13. Show off your festive spirit with this cheerful - and appealingly vibrant - black and yellow 1940s inspired Happy Halloween necklace that includes bone shaped beads and a crescent moon name plaque. $26.65 from Viva La Lux. 14. Summer Blue Jewelry's Halloween offerings always knock it out of the ballpark and this off-the-charts cool Eye of Newt Potion Bottle Brooch is certainly no exception. Check it out and then make sure to browse through the rest of this talented jewelry designer's old school inspired Halloween themed creations. $26.00 from Summer Blue Jewelry. 15. If hearing the words "Beetlejuice, Beetlejuice, Beetlejuice" sets your heart aflutter, may I suggest this wonderfully well priced "No Feet" shrink plastic double ghost brooch inspired directly from Tim Burton's 1980s classic film. $6.34 from Sayonara Baby. 16. Hi there, hot stuff! Whether you're looking to channel your inner she devil, an ancient sun/fire goddess, or sport a candle shaped costume for Halloween, these alluringly pretty sparkly red glitter and gold tone metal flame shaped vintage earrings are for you! $12.50 from Chronically Vintage on Etsy. 17. Seasonally related novelty jewelry abounded in the 1980s and early 90s, and a very decent amount of it is still available in the second hand market today, often for a total song. Case in point this smile inducingly cute bat and pumpkin brooch from the eighties. $6.00 from The Little Wicked One. 18. Cute, kitsch and very fun, these dazzling 1950s inspired confetti lucite coffin shaped earrings are just the thing to sport for an evening stroll through your favourite local graveyard. $19.44 from Miss Vaudeville. 19. Jazz up the fall time necessity that is layering with some yesteryear pinup girl style when you slip on this stylish sweater guard. $13.00 from Abbie's Anchor. 20. Big, eye-catching and marvelously fun, this generously sized resin ring (embedded with real candy!) stars a smiling jack-o-lantern is sure to be a treat to wear! $15.75 from I Sew Cute. 21. Fabulous for autumn time now and Canada Day come July, this elegantly pretty c. 1970s - 80s does 1940s/1950s terracotta ceramic bead and gold tone metal maple leaf dangle charm choker necklace is a sophisticated piece that would make for a great addition to any vintage, pinup, rockabilly, boho, goth or modern wardrobe. $16.00 from Chronically Vintage on Etsy. 22. 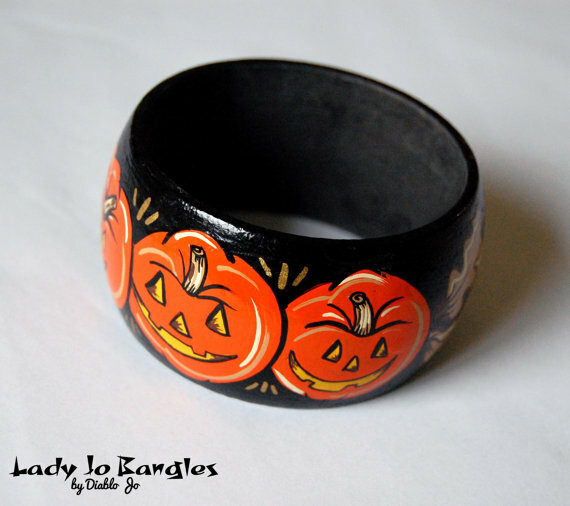 Decked out with some seriously wonderful mid-century inspired artwork, this attractive hand painted jack-o-lantern themed wooden bangle bracelet is just the thing to wear solo or partner with your favourite fall hued Bakelite pieces. $18.65 from Lady Jo Bangles. 23. Fans of cute enamel pins the world over are sure to squeal (meow) with delight over this adorable little kitty ghost offering, which is clearly a specter that's far more sweet than sinister. $8.00 from Em & Sprout. 24. Equal parts adorable and eerie, this charming, very vintage looking skeleton dangle brooch is sure to bound a shiver of delight down your spine! $21.98 from Mrs Polly's Lucite. 25. Aww! That's what I said when I first laid eyes on this darling glitter resin finger ring. We often associate bunnies with spring, but as this creative piece of handmade jewelry attests, they can work splendidly for All Hallows Eve' as well. $15.00 from Hypnotic Sweet Treats. 26. Owls and October go together like Halloween and caramel apples, so why not celebrate this festively appropriate avian critter in chic old school style care of an oversized articulated pendant necklace like this 1970s charmer. (Currently on sale at the time of writing for) $29.00 from The Best Vintage Clothing. 27. Boasting colours that match the two most common ones seen in Halloween pumpkins these days, this delightful pair of 1950s - 1960s orange and white cluster bead clip-on earrings even somewhat resemble a mound of piled up pumpkins to boot! :) $10.50 from Chronically Vintage on Etsy. 28. With a very vintage looking style and a seriously cute face, this Scared Pumpkin Necklace is just the statement making piece of jewelry you need to let your love of Halloween shine through in any outfit. $31.97 from You Make Me Design. 29. Be a total glamour ghoul when you rock this eye-catching twinkly glitter Bride of Frankenstein head shaped brooch that's done up in a nighttime perfect combo of black and gold. $13.00 from Poison of Choice. 30. Enchantingly elegant and perfect for all sorts of Victorian, Edwardian and gothic style looks, this beautiful black floral lace choker necklace is sure to have you swooning nearly to the point of needing a 19th century fainting couch. $10.99 from Blue Velvet Vintage. 31. What list of vintage inspired, Halloween perfect jewelry would be complete without including one of Creep Heart's magnificent offerings, such as this precious pair of dancing skeleton kitty dangle earrings. $29.95 AUD from Creep Heart. ...Must refrain from buying every single item above! :D Halloween themed jewelry, accessories and fashions one of those "shut up and take my money!" situations for me, and I'm not complaining in the slightest. My October 31st approved wardrobe selection has grown in leaps and bounds over the past few years in no small part thanks to some of the sources included in today's fun vintage shopping post (many of which offer multiple Halloween themed pieces, so it's definitely worth checking all of their shops out in greater detail). I'm sure, too, that as time goes on, I'll continue to buy from more and more brands that I haven't yet shopped from before, while also returning to tried-and-true personal favourites, such as Luxulite, Summer Blue Jewelry, Charcoal Designs, Sayonara Baby, Poison of Choice, and Erstwilder. Naturally, though this may go without saying, there are certainly many other incredible brands out there who are making vintage inspired Halloween themed jewelry (and fashions, etc), as well as many more sources of genuine vintage pieces that fall under this header, too. Likewise, if a certain maker/company didn't appear here, that definitely doesn't mean that they weren't worthy of inclusion; I simply had to cap this post at a reasonable number of entries and look forward to continuing to feature other brands in future Halloween related posts. If one is searching for additional places to shop from, stores and online shops that sell goth and gothabilly jewelry and accessories, are often a stellar spot to check out as well, as many of the offerings from such locations tend to naturally suit Halloween time extremely well. I've recently ordered a few new Halloween jewelry items myself and can hardly wait for them to arrive! Some may appear in outfit posts this year and if not, very likely down the road during future spooky seasons. I'm really appreciative to all of the brands who sell vintage appropriate Halloween pieces, as well as to the true vintage sellers who list such offerings. For those of us who go weak in the knees for Halloween, it is sincerely wonderful to be able to enrich our wardrobes with these kinds of celebratory, beautiful accessories (all of which, if so desired, can of course be sported all throughout the rest of the year, too, especially if your wardrobe has goth-ly inclinations). Have you picked up any new vintage or vintage inspired Halloween wearables for yourself this year? Which of the ones highlighted here speak to you the most? What would your ultimate piece Halloween related jewelry look like? And last, but certainly not, least, are you as psyched as I am about that fact that October 31st is little more than three weeks away at this point? OMG, so cute! I have no idea how you find such amazing stuff but keep it coming! That's such an awesome compliment, Ally. Thank you very much. It's a joy to share some of the vintage (and handmade) goodness that has been catching my eye lately with my dear friends and readers here. I'm happy to know that you enjoyed this fun Halloween post - I had a ball putting it together. A lovely array of seasonal jewellery to choose from here, though I am sure you know what my favourite piece is! If in any doubt, number twenty five makes my heart very happy! Oooh, I swear, I thought of you when I discovered that super cute Halloween bunny brooch. It's so rare to find this beautiful critter represented in fall jewelry. Kudos to the designer on creating it and marrying spring with autumn so harmoniously. I'm delighted that I could be of help to you in shopping for your mom. We have some folks in our family that are challenging to shop for as well and I so adore it when blog posts that I read can help inspire me on that front, too. Aren't they though? Some sold out super quickly - before I even got to them (I was able to order four of this year's Halloween series though and am really hoping that they reach me before the 31st - no worries if they don't though, there's always future October 31st's to save them for :)) - but it's possible that others are still available. I was thrilled to see Erstwilder launch a dedicated Halloween line this year and seriously hope that it becomes an annual tradition. I have bought a gorgeous pumpkin brooch from Luxulite which got great comments from my colleagues at work when I wore it. I also just ordered an octopuss necklace from Cherryloco, I must say love their quirky necklaces. How fabulous!!! Katy's Halloween offerings are off-the-charts fantastic. Unlike with Luxulite, I haven't ordered anything from Cherryloco myself yet, but definitely want to in the future. Such darling pieces! I hope that you adore your cute octopus necklace. How immensely sweet of a blog reader to gift you with a mourning brooch. I'm drawn to mourning jewelry and attire (and the deeply fascinating history around it) like a moth to a flame. I really hope to add more to my own collection as time goes on. Thank you very much for your lovely comment, sweet Kate. I hope that you have an excellent October! Hi Jessica! What's not to love about Halloween or any of these adorable treasures. That sweater guard is beyond fun, as are the other things! It would be awesome to wear any of these each day until the big day comes and then pile on every one of them at the same time on the 31st :-) I know how you love Halloween and I hope the upcoming one brings all good things to you and yours. Happy Autumn! Thank you ever so much, my sweet friend. That's such a great idea! I don't know if I have quite enough Halloween themed brooches yet to sport a different one each day, but perhaps by next year I will. It would be a blast to take your suggestion, post each one on social media day-by-day and in a roundup post here at the end of the month. Such a great idea. Thank you for sparking it! I hope that you and your loved ones have a marvelous, merry and very happy Halloween season as well. I can't believe Halloween is coming up so fast! Thank you for taking the time to compile this list. Such lovely finds and I love looking at them all! I really loving the fall inspired necklaces in the your Etsy shop! So cute!!! I know! While I wish that October could stretch on for eons, the one perk to it flying by is that it means Halloween gets here faster. :) My absolute pleasure! This was a super fun post to research and pen. That's really sweet of you to say (re: the autumn themed necklace from my shop). You're such a dear! Love this! I want it all! .... and fab to see my good friend Lady Jo Bangles in there too! How fabulous that you're friends with the talented lady behind Lady Jo Bangles. Her work is sensational - and so reasonably priced. I wholeheartedly hope to add one or more of her stellar creations to my wardrobe one of these days. Thank you very much for your great comment. Wishing you a splendidly fun October! The Ouija brooch is something I'd wear ! and I can feel your excitement as the days go by. Same here - big time. I'd sport it throughout the year, not just in October. I've always enjoyed Ouija boards and jewelry depicting them. It's really cool that you enjoy them, too. Oh my all of these are wonderful! Want Want Want :) Great selection of Items Jessica :) Enjoy the Halloween Season! Thank you very much, sweet Liz. I want every last one of them as well. I've ordered a few new brooches this season (none have arrived yet - hopefully soon), but after Edmonton, I have to keep my spending on the lower side (especially with Christmas just around the corner). I'm in love with the ones that I'm waiting on and can hardly wait to sport them. Have you ordered any seasonal wearables yourself this year? I love the jack-o-lantern jewelry! I myself have some earrings with jack-o-lanterns, witches, spiders, bats, and ghosts, as well as a spider necklace with webs as well as spiders. Unfortunately, one of the spiders broke off shortly after I got it, and I haven't been able to get it soldered back on yet. Some years back, by the Baltimore Airport, I found a little jewelry box shaped like a spider web, with a red jeweled spider on top. Right about now, I really miss my navel piercing, since I was looking forward to switching out my purple opal navel bar for something Halloween-themed. I'm hoping there's no rejection when I get it redone next year! There's also an awesome rose-gold septum clicker with a bat, for when I eventually have my septum done, though since it's Body Vision Los Angeles jewelry, I know it's going to be pretty pricy. The pinkish-purple jeweled lotus (which I thought was a Magen David) in my tragus piercing was $120, which is towards the cheap end for that company! Your collection sounds fabulous! I'm sorry that one of the spiders broke off of your necklace though. What a shame! Hopefully you'll be able to solder (or glue) it back into place. Fingers crossed that you don't run into that situation. Given that I'm allergic to nickel (you can of course get nickel-free belly rings, but still) and have super sensitive skin in general, despite being wildly tempted in my younger days, I've never had my belly button pierced. If I safely could, I definitely would. It's such a fun, playful piercing. Wishing you endless good luck with both of your planned piercings, dear gal. I totally understand and am touched to know that you could glean some scrumptious culinary inspiration for this season from my site even though you don't celebrate Halloween. That's really lovely to know. To the 9th degree, my sweet friend, the absolute 9th degree! :) It's just amazing how much joy October brings me. And you know, the older I get, the greater I find these wonderful feelings intensify with each passing year. It's only the 10th of October right now, but I'm nearly as giddy already as though it was the 31st. :) I love the countdown to the big day so much, too, and am doing all I can to get (and blog! :)) the absolute most of out it. Tons of hugs & merry Halloween wishes to you and your honey! Such great minds! That's just so cool! I love it when our blogging paths converge like that. It makes me wonder when it will happen next and what the topic at the heart of such will be? Aren't Katy's pieces fabulous? I'm a Luxulite addict through and through. I even bought a cute (it has very kawaii style woodland critters all over it) little treasure trunk shaped storage box to keep my collection in. One of these days I should do a post highlighting the ones that I have from her shop up until that point. Now, I have seen a lot of wonderful things. So many beautiful accessorizes, to celebrate the holiday, so dear to your hear, right? I say: come autumn, there's so much things to chose from. We leave the fruit-looking brooches to the side, and take out the spiders, owls, bronze leaves... and therefore adorn ourselves with this adorable season. Oh, I'd love it if we lived closer to one another. Endlessly dear to my heart. It's definitely my favourite holiday and something that brings me a tremendous amount of joy, comfort and inspiration the whole year through. It's wonderful that you embrace autumn a great deal as well. Is Halloween and/or All Souls Day observed at all in Serbia? Would you ever want to experience a full on North American All Hallows' Eve first hand, my sweet friend? I so wish that as well! Why, oh why, hasn't Star Trek style teleportation (or a mind blowingly fast form of airline travel) been invented yet. It would be immensely fun and meaningful to celebrate some of these beautiful fall days together. Thankfully we can still delight in them together through the magic of the internet. You're sincerely welcome, sweet Laurie. You make such heartwarmingly adorable jewelry. I knew the moment that you posted about your latest Halloween perfect pieces, I simply had to include on in this particular post. Thank you for sharing your crafting talents with all of us and for making such whimsically wonderful pins. *Huge smiles* :) You are so very welcome, my fellow Halloween adoring lady. I had a very strong feeling that you'd been keen on this post. It was uber tempting for me to go on a shopping spree while penning it, but alas, I behaved (especially after all of the recent costs involved with our trip to Edmonton and with Christmas just a matter of weeks away) and only ordered a small number of new Halloween jewelry items for myself this time around (including some from Erstwilder's festive line, as they usually sell out at the speed of light). Thank you! I hope that your weekend was a sunny, enjoyable one as well. That's so very exciting! When I lived in Ireland (2004 - 2006), it was starting to gain more (one might almost say, ironically, given that so many elements of Halloween have their roots firmly planted in Ireland itself) traction there, with decor and some candy in certain shops. Even in Dublin though, trick-or-treating wasn't that big yet, which was quite the cultural shock to me (especially given that I was just 20 in 2004 and had, myself, been trick-or-treating each year of my life until the age of 16; a time and memory that was still bracingly fresh in my mind at that point). I can't speak to if Halloween has continued to grow in popularity there since we left, but I seriously hope that it has and that it continues to spread far and wide across the UK and Europe (and the whole world!) in general. Wishing you and your family a fun filled and fabulous All Hallows' Eve season! Oh my gosh. OH. MY. GAWDS! I hear my wallet squeak and squawk ... grumble. *checks out websites* Sigh ... take my money. Perfectly said. I feel exactly the same way. Alas, I was a good little ghoul and only ordered a small number of new Halloween themed jewelry items this year on the heels of our recent trip to Edmonton and the winter holiday season mere weeks away. I'm thrilled with what I was able to pick up though of course and really hope that some (or all) of it arrives before the big day itself. Many hugs & the happiest of Halloween wishes to you and Ed! Sending big hugs & merry Halloween wishes your way! Oh my gosh all of these are so cute I was almost squealing as I scrolled though! I really really love that Jack-O-Lantern pineapple! That's so perfect! I am definitely a super Halloween fan! Isn't that so fabulously creative? I love traditional Halloween themes and imagery, but I also really appreciate when people think outside of the box regarding their October 31st creations, such as the darling pineapple and bunny themed pieces here. So cute, quirky (in the best kind of way) and unexpected. The little kitty ghost pin is adorable! You're sweeter than an Olympic sized swimming pool filled with candy corn, dear Daphne. Thank you so much for keeping a keen watch out for possible pieces for me. I wholeheartedly appreciate it. These are all so unique! And I love that little Wednesday Addams brooch! Isn't it darling? I am so hoping that Erstwilder will create other Addams Family themed pieces in the future, too. Wishing you a marvelously merry Halloween season! Oh, I loved this post, dear Jessica, so nice accessories! I love Halloween and this selection is so sweet! My favorite pieces were the pumpkin earrings, the witch's brooch (number 2), number 19 that is a double brooch with a chain - I loved that! And bats, owl and the skeleton cats earrings :) All so lovely! Hope you have a very nice weekend! Hugs and regards! So many adorable finds! I love Halloween, and a little something spooky around your neck or on your ears is such a fun way to get into the spirit. It really is! It's sort of like the more subdued way to sport a costume all month long, without actually donning one (until so desired). Oh these are so lovely. The abundance of cute vintage style jewellery at the moment is leaving us so spoilt! What an amazing Halloween selection. So tempting!! Thank you sweetly, dear Elizabeth. That I unequivocally am. I'm one of those people who lives by the #Halloween365 premise and I wait on the edge of my seat for October to arrive so that I fill many of my posts (that/this month) with that unending passion for one fleeting chapter of the year. I hope that you have a fun filled, fabulous October as well! That Summer Blue potion pot is excellent - it's so nice to see something a little different. And some of the other pieces... why is Halloween only one day a year?! Isn't it though? Summer's Halloween line this year absolutely, positively knocked my socks off (and as such, I simply had to place a wee order, as one does :)). I hear you there loud and clear. I turn all of October (and really, much of September usually, too) into Halloween season and love that my blog gives me a great outlet through which to further embrace and share my (and many other peoples') unending love for this enchantingly fun holiday. The rest of the year, I live by the #Halloween365 principle and always keep Halloween alive in my heart. It brings me too much joy not to. It's really awesome that you feel the same way, too. Aren't they though? Halloween time in general just exudes a playful, wonderfully fun quality that I think is a good part of the reason it has become so engrained in our culture (in some parts of the world at least) to this very day. It's fabulous with cute, kitschy, and often very beautiful pieces of jewelry like this can tap into that spirit and help it shine all the more through our festive outfits. Amazing accessories! Every single piece so beautiful and unique. <3 Thanks so much for sharing. Thank you sweetly, darling gal! Aren't they though? So creative, fun and charming! I really admire the talent of each of the people behind these wonderful creations and hope to be able to own something from as many of their shops as possible one day (I can say as much about some, but certainly not all of them). Isn't it sensational? I'm soooo hoping that they'll keep the Addams Family theme going and release versions of other relatives over the years (it would be an instant "shut and take my money" moment if they put out a Morticia one - swoon!). Wow! I just came across your post after looking through my etsy stats and seeing your site listed! And I just wanted to say thank you for including my Pineapple Jack-O-Lantern brooch! All of the items in your list are fabulous! I love them all! Hi Melissa, thank you very much for your wonderfully nice comment. It's a pleasure to hear from and "meet" you. Your Pineapple brooch is the absolute cutest - as is all of your delightful work. I'm really happy to have discovered it and been able to make it a part of this festively fun post. Happiest wishes for a stellar Halloween!